The Transformer TCG is a fast, easy-to-learn card game for two players. Each player builds a team of Transformers characters, and powers them up with battle cards. The character cards are extra-large, twice the size of standard playing cards, and can be flipped over to transform from robot mode to alt mode. The battle cards feature action and upgraded cards to augment the character cards. 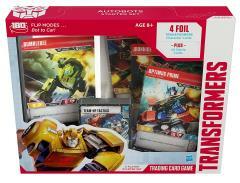 The Autobots Starter Set contains all the cards needed for two players to begin.